We haven't checked in on We Kill Monsters since last May and, given that issue #6 is coming out on Wednesday, it seems high time to revisit the book. A fair amount has happened since #1. Oh, there's been plenty of people getting slaughtered by monsters, monsters getting slaughtered by Jake and Drew, death-defying escapes, disturbing lunch breaks, car chases, guns and home-made pneumatic harpoons. But what's also turned up is some interesting plot developments. The protagonists (and readers) have learned that these monsters are being created by the cereal company that Vanessa's boyfriend works for, and he seems to be directly involved. 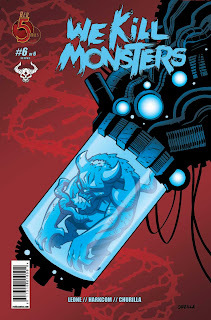 This issue starts just before the denouement, with the four main characters confronting one another in one of the monster labs. I won't spoil the particulars of the final issue for you, but there are more monster fights, the three heroes all fight... well, heroically, and they ride off into the metaphoric sunset victorious. Well, mostly victorious. And with the obligatory suggestion of more adventures to come. The story (both as a whole, and this issue specifically) is solid, the characters all work and act well, and the series has been pretty fun overall. It has a lot of the (well-done) elements that attracted me to comics in the first place. I did have a few minor quibbles with this last issue -- notably that the action got a little confusing during the big fight at the end. The art felt a tad rushed in places. Like artist Brian Churilla didn't realize how many different monsters he'd have to design until he got to the big fight scene. That's complete speculation, of course, from my back seat. Fortunately, the scene in question is, I think, supposed to be fairly chaotic and, in any event, the specific choreography of that fight isn't critical to the book. It's mainly only note-worthy as a speed bump during an otherwise very smooth ride. I've noted before how impressed I've been with Red 5's titles in general. I have my ongoing favorites of course *coughatomicrobocough* but We Kill Monsters is definitely something I'll be looking for if they come back with a second (or third, or fourth...) volume. Writers Christopher Leone and Laura Harkcom came up with something really entertaining, both in concept and in execution and that, I think, says a lot given that it's their first foray in comic book storytelling. Well worth it to track down all six issues if you haven't been keeping up with it! We Kill Monsters #6 is due in comic book shops this Wednesday. I can't find word yet on whether or not the whole series is collected in paperback form, but I'd be surprised if Red 5 doesn't collect this at some point.